Prisoner #11593-051 at a Federal Correctional Institution in Texas put up strong numbers in Tuesday’s Primary Election in West Virginia. Keith Judd, who is currently serving prison time for making threats at the University of New Mexico, had the support of 41% of voters in the race for the Democrat Presidential nomination compared with President Barack Obama’s 59% of the vote, according to results reported on Tuesday night. "It's an embarrassment to the state and, I think, it's an embarrassment to the Democrats," West Virginia Wesleyan Political Science Professor Robert Rupp said of those numbers. "When people cast a protest vote, they never bother on who they're voting for. They just want to use that as an expression on who they're voting against." Democrat Consultant Mike Plante agrees. "I think most of the people who were casting a vote for Keith Judd, it was not a vote for him, it was a vote expressing dissatisfaction with the President," Plante said. "Barack Obama has not run strong here in the past and probably will not run strong in the Fall." In the Democrat Primary, Judd beat President Obama in the following nine counties: Hardy, Logan, Mingo, Webster, Wyoming, Boone, Clay, Gilmer and Tucker. 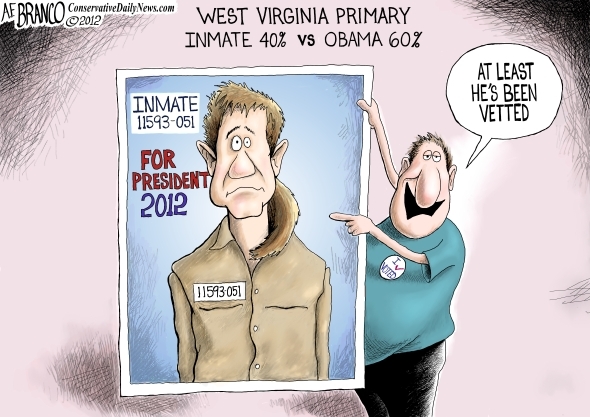 Tags: inmate vs Obama, Keith Judd, Barack Obama, West Virgina, democratic primary, political cartoon, William Warren, Metro News To share or post to your site, click on "Post Link". Please mention / link to the ARRA News Service. Thanks!